The Hitachi Construction Machinery Group has been calculating CO2 emissions during product life cycles since 2007, and has done the same for CO2 emissions for the entire supply chain (including Scope 3 emissions) since 2009. We have followed the “Basic Guidelines for Calculation of Greenhouse Gas Emissions throughout the Supply Chain” of Ministry of Economy, Trade and Industry and the Ministry of the Environment when calculating emissions, and have aggregated the results. For the domestic and overseas Group companies, Hitachi Construction Machinery Ltd., received the third-party verification for energy consumption of Scope 1, 2, and greenhouse gas emissions of Scope 1, 2, 3 in FY2017 based on Criteria of ISO14064-3. This verification of Scope 1 and 2 covers domestic and overseas production bases (11 domestic factories and 7 overseas factories.). This time, we expanded the range of Scope 3, 2 categories added and the assessment covered : category 1, 2, 3, 4, 5, 6, 7, 9, 11 and 12. For the domestic and overseas Group companies, Hitachi Construction Machinery Ltd., received the third-party verification for energy consumption of Scope 1, 2, and greenhouse gas emissions of Scope 1, 2, 3 in FY2016 based on Criteria of ISO14064-3. This verification of Scope 1 and 2 covers domestic and overseas production bases (11 domestic factories and 7 overseas factories.). We expanded the range of Scope 3, 2 categories added and the assessment covered : category 1, 3, 4, 5, 6, 7, 9 and 11. 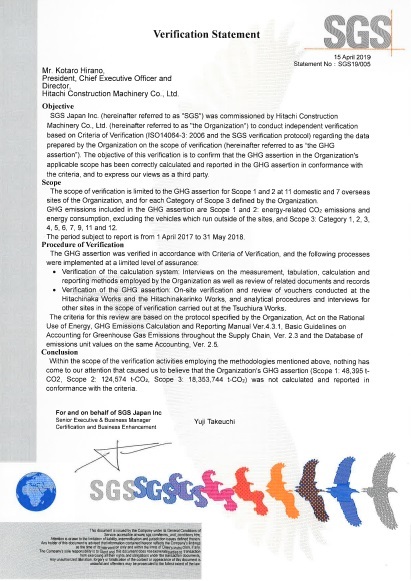 For the domestic and overseas Group companies, Hitachi Construction Machinery Ltd., received verification for greenhouse gas emissions of Scope 1, 2, and Scope 3 in FY2015 from SGS Japan Co., Ltd. This verification of Scope 1 and 2 covers domestic and overseas production bases (11 domestic factories and 7 overseas factories.). This time, the assessment for Scope 3 covered : category 1, 4, 5, 6, 9 and 11. 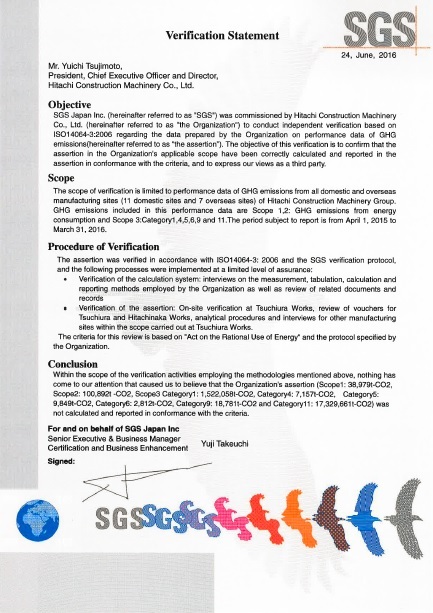 HCM had the Group’s international and domestic Scope 1, 2, and 3 greenhouse gas emissions for FY2013 verified by SGS Japan Inc. This time, the assessment covered not only the major factories in Japan but also Group businesses – 11 domestic factories and 6 overseas factories. Hitachi Construction Machinery Co., Ltd., had our FY2013 energy usage amount and CO2 emissions third-party verified by Bureau Veritas Japan Co., Ltd., and our other environmental load data reviewed. This data has been reflected on our “CSR & Financial Report 2014” and “Hitachi Sustainability Report 2014” and we are striving for disclosure of even more reliable non-financial based information. As one of the Hitachi Group’s eco products, HCM Tierra ZX50u-5A has been validated by a third-party auditing body “Bereau Veritas Japan”. Eco products are those which meet Hitachi Group’s standards based on its 8 evaluation criteria set in the ‘DfE assessment’ method. This criteria includes lightweight, recycling factors, environmental conservation factors, and energy saving. The third-party validation determines whether Hitachi Group’s own DfE assessment is reasonable. The validation concluded that the there are no issues with the assessment of ZX50u-5A. 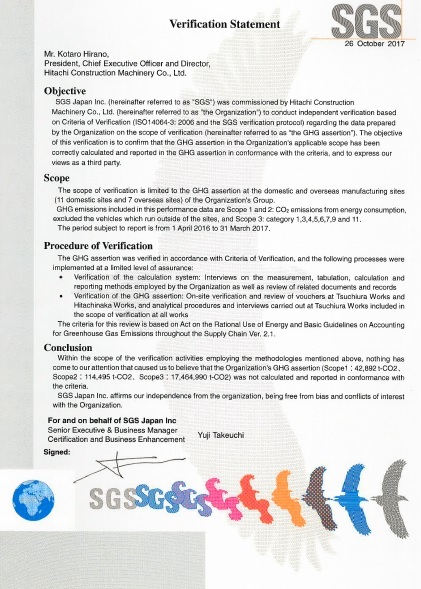 HCM received the third party verification by SGS Japan Inc. on energy and CO2 data to ensure trustworthy environmental load data for FY2012. In the ‘Environmental Vision 2025’, the overall Hitachi Group aims to help reduce annual CO2 emissions from all Hitachi products by 100 million tons by FY 2025, and among that the HCM Group aims to reduce CO2emissions from the use of our products by 3.5 million tons. The HCM Group selected four types of equipment, being mini excavators, hydraulic excavators, wheel loaders, and rigid dump trucks, and calculated the volume of CO2 emissions reduction from new models including energy-saving improvements and electrification etc. compared with the products of the base year, fiscal 2005. Regarding the calculation method, Bureau Veritas Japan Co., Ltd. undertook a third-party review of the Hitachi Group in 2012. In FY 2013, a third-party review is planned including two additional types of equipment, crawler cranes and road construction machines. The estimated amount of CO2 emissions reduction by the use of products newly offered for sale by HCM in 2006 and subsequently (hereafter ‘Developed Products’) compared to products sold or being used in 2005 (hereafter ‘Base Products’) continuing to be used by customers thereafter. The total annual contribution to reducing CO2emissions over the estimated usage period of the products is then calculated. *CO2 emissions coefficient: Electricity use: IEA “CO2 Emissions from Fuel Combustion Highlights (2011 Edition)” *Rate of operation: Average annual operating time *Rate of contribution: For parts and materials, and where the contribution to reducing CO2 emissions for those items alone cannot be calculated, the degree of contribution to reducing CO2 emissions for products using those materials or parts is included as the rate of contribution.